Under the North Carolina Vacation Rental Act, your booking payment over the phone or via our online booking system is evidence of your acceptance of the terms and conditions set forth in the rental agreement. Upon booking, you will be emailed both the receipt for your transaction and the rental agreement. Once you return the completed rental agreement, we will email you the specific property directions and the access instructions for the cabin about two weeks before your arrival. If you would like to review the agreement before making your reservation, please click here (doc or pdf). If you cannot view the rental agreement by clicking the links above, please contact us and we will email you a copy of the rental agreement. Please note that bookings made through Airbnb are subject to the property's house rules and have different Terms and Conditions. Please note that for many of our properties weekend rates are higher. Occupancy is stated as a range where the lower number represents how many guests can sleep in beds and the higher number includes additional guests sleeping on futons or sofa beds. We supply linens for the cabin based off the occupancy, so please be sure to fill out your rental contract correctly. We maintain a family atmosphere for the maximum enjoyment for all our guests. We RENT ONLY to married couples, families, and responsible adults 25 and OLDER. If you book online and your reservation does not meet the Tenant Duty requirements (including the Age Policy and Adult Guardian Policy) we will actively refuse service and cancel your reservation. Your cancellation will be subject to a reduced cancellation fee of $50.00. 10% tax (or the current legal rate) is charged on all rentals. Check in is after 3PM and Check Out is before 10AM. NO Early Check-ins and NO Late checkouts without prior permission from our office. Extra charges may be assessed for non-compliance. A 50% down payment by credit card is required to confirm a reservation. In addition, the Limited Damage Waiver or Security Deposit will be required at the time of booking. We accept Visa, MasterCard, Discover, and American Express. The balance of the rent and tax is due at least 30 days prior to the stay. At the time of the balance due, we will then charge the card that you initially paid with unless we are contacted prior to this time with other payment information. It is your responsbility as the tenant to inform us if you wish to pay the remainder by check or on another credit card before your payment is due. - The down payment is refundable (less a $75 charge) only with written cancellation at least 30 days prior to arrival date. Without 30 days notice, down payments are only refundable if the cabin is re-rented. - No shows and early departures are obligated for the entire amount of the reservation. - Failure to return your contract in a timely manner could result in a cancellation of your booking without a refund. 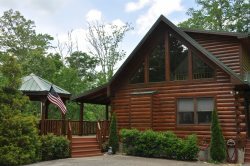 Acting in the best interest of all parties involved, Great Smokys Cabin Rentals reserves the right to actively refuse the service of a rental reservation and/or cancel reservations wherein the Guest Duties or Agent / Owner Duties cannot reasonably be fulfilled. If you book online and your reservation does not meet the Tenant Duty requirements (including the Age Policy and Adult Guardian Policy) we will actively refuse service and cancel your reservation. Your cancellation will be subject to a reduced cancellation fee of $50.00. Select cabins have limited internet access. In the mountains speeds are typically slower than other areas and sufficient for light use only. Internet access is available in select properties for light surfing – for example, checking emails, browsing the internet for things to do in the area, participating in social networking, and online shipping. Mountain internet access is not suitable for heavy usage such as downloading large files, remote desktop connections, and streaming video through services such as Netflix, or Amazon Video. Heavy usage is prohibited. Should you engage in heavy usage, additional charges may be assessed towards your stay. We offer a Military Discount & Repeat Guest Discount to our guests. To receive either discount the reservation must be made over the telephone. For the Repeat Guest Discount, the reservation must be made under the same customer name as the prior reservation. We are not able to apply these discounts to web reservations. Only one discount per stay. For longer stays the free night from the weekly rate may be a greater savings. - A Limited Damage Waiver in the amount of $40 will be charged to all reservations upon booking. It is a non-refundable fee waiving your responsibility for up to $1,000.00 of accidental, un-intentional damage occurring during your occupancy. Damage that is not deemed un-intentional or accidental, or damage incurred by pets or unsupervised children will not be covered under the damage waiver. - The Basic refundable Security Deposit may be used in lieu of the LDW. The security deposit is $600 and would be charged upon booking. Please call to reserve if you would like to use this option. This deposit must be paid by credit or debit card. - Large Party Security Deposit – a refundable fee of $400.00 will be charged for regular reservations of 8 or more guests. This deposit must be paid by credit or debit card. - Singles/Students Security Deposit --We do not rent to singles/students under the age of 21 without an accompanying parent. Singles/students 21-25 must have at least one party member aged 25. An Adult Guardian Security Deposit of $1,500.00 is required. The Limited Damage Waiver is not available for these parties. Maximum occupancy of these reservations is a party of 6. This deposit must be paid by credit or debit card. No indoor smoking is allowed. Any evidence of smoking inside the cabin will cause the entire Damage Deposit to be forfeited. Please restrict all smoking to outside areas and clean up all cigarette butts and smoking materials from the grounds. Burn marks on the outside furniture, decks and railings will cause the entire Damage Deposit to be forfeited. Pets are permitted only with prior approval and only in selected cabins. Additional Pet Rent and an additional Damage Deposit on your credit card will apply. Pet Rent is $75.00 per pet per stay. Pets brought without advance notice will be charged DOUBLE the normal pet fees. Pets brought to cabins that do NOT allow pets can result in immediate eviction with forfeiture of remaining paid stay. Pets are not allowed on furniture (including beds and sofas), at any time. Unattended pets in cabin must be crated/caged. Evidence of any pet being in the hot tub will be cause for loss of security deposit in full and may be subject to additional fees. The Limited Damage Waiver does not cover damage inflicted by pets. Dishes, Kitchen utensils, cookware, bed linens, blankets, pillows, towels. We recommend that you bring or purchase consumable supplies (paper products, trash bags, soap, detergent and toiletries). There will be a “starter amount” of these when you arrive, but it is not meant to last your stay. If there is a charcoal grill, wood-burning fireplace or fire pit, you will need to supply the fuel. We recommend that you bring insect repellent. We also recommend that you bring beach towels if engaging in water activities such as white-water rafting. Changing the dates or cabin which you have reserved may incur a $75.00 Change Fee and is at the broker-in-charge's discretion. We offer Travel Insurance through CSA Travel Protection, called the Guest Protect Plan. We highly recommend purchasing Travel Insurance to protect the investment you've made for your reservation. For more information please click here. When making reservations during the winter months, you must consider the possibilities that inclement winter weather will affect your stay. During the months of November through March, dangerous snow or ice storms are possible in the Western North Carolina Mountains. - Check the weather forecast and road conditions before you leave home. Here is a link for your convenience. Enter 28713 for the zip code. - Make sure you have in your car: warm clothing, blankets, boots, food, flashlights and water. - Keep your car full of gas as well. The NC Department of Transportation now provides current road conditions in real time for your cell phone. To access this, type m.ncdot.gov into the browser for your smart phone. - Plan to arrive before dark as our mountain roads do not have street lights and road conditions tend to deteriorate at night. - Purchase your groceries before you arrive at your cabin. - We recommend you come prepared with a Make sure you have in your car: warm clothing, blankets, boots, food, flashlights and water. - The NC Department of Transportation now provides current road conditions in real time for your cell phone. To access this, type m.ncdot.gov into the browser for your smart phone. In the event that you so choose to keep your reservation after we have advised you NOT TO COME, you are responsible for your own safety. We will not be held liable and will not refund or reschedule your stay. You may also not be allowed to enter the cabin should you be able to get to it – if you access the cabin after we have cancelled your reservation without our permission, you will be trespassing.